Yesterday I had a workshop with Lili and Natasha and showed them the marker layering technique (watercoloring with blender pens). They both enjoyed the new technique and it's always good to find another way to use the Stampin' Write markers and ink pads. Thank you, Lili and Natasha, for spending the afternoon playing ... and thank you for the beautiful orange gerberas! On to the card for today. I'm participating in SCS's "Ways To Use It" Challenge (WT376 - make a card that focuses on green). I love the Trendy Trees set from SU! and used it today, making three trees all in different shades of green. Hope you like. I punched three 1 1/4" squares in bright, scrap cardstock and added temporary adhesive to the backs. I made a light pencil line 3/4" from the bottom of my Whisper White cardstock and then lined up the squares, spacing them evenly across the page. I lined up my square punch with the bright squares and then punched through my card front. I erased the pencil line. I added the Certainly Celery polka dot strip at the top, stamped the sentiment in Garden Green ink and wrapped the Garden Green ribbon around, tying a knot off center. I used a glue dot to hold the knot in place. On a second piece of Whisper White cardstock, using the Stamp-a-ma-jig for placement, I stamped all the trunks with Soft Suede ink and then added the tree tops, starting with the lightest color on the left (Certainly Celery), Gumball Green for the middle, and ending with the darkest on the right (Garden Green). 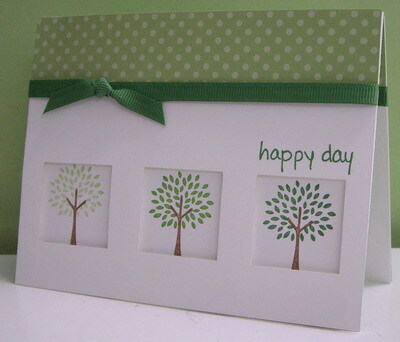 I mounted the tree stamped card front to a card base of Certainly Celery (for stability). I mounted the punched card front on top of the stamped one, popping it up with dimensionals to add depth. The inside panel is Whisper White with the same polka-dot DP strip at the top and a piece of Garden Green ribbon wrapped around (no knot this time). I stamped a tree in the bottom right-hand corner. Labels: all occasion, CAS, stampendous, Stampin' Up! Fabulous layout! I love the way the trees are framed by the punched squares. I'll be CASEing this for sure! I love the concept, the color and well, the whole card! Happy day to you too Loll. I love your sweet Trendy Trees. Great way to show off different shades of green...even the brand new Gumball Green. TFS my friend and glad your girlfriends liked the marker layering technique too.